For the period ending November 17, 2017 ... New DVD and Blu-ray selections added to the DVD & Blu-ray Release Report's database. Hollywood often turns out scripts for movies that, when watching the final result, you find yourself rolling your eyes and muttering to yourself, “really? !” You’ve certainly seen mysteries, thrillers and horror tales that are so convoluted that even the “suspension of disbelief” can’t save them. 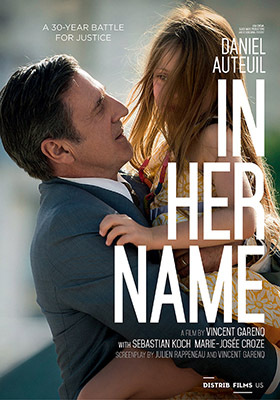 Enter French filmmaker Vincent Garenq and the Distrib Films release of In Her Name, which is the story about the mysterious death of a 14-year old girl and the cat-and-mouse legal — and extralegal — game between a father and stepfather that unfolds. Icarus Films announced this past week that this French-language import will be making its domestic DVD debut on Jan. 16. So this is just a French version of a Hollywood script mash-up, right? A girl dies under mysterious circumstances, the father accuses the stepfather of murder and France (the home of the father) and Germany (where the stepfather lived and the teenager died) refuse to cooperate with each other over the “incident.” Eventually the father takes matters into his own hands and has the stepfather kidnapped, spirited out of Germany and into France … and France agrees to put him on trial for murder! Now who on this planet is going to believe a story like that? Well, get ready for this, In Her Name, is based on actual events!!! The film is based on the case of Kalinka Bamberski, played in the movie by Emma Bessonm, who was living with her stepfather, Dieter Krombach (Sebastian Koch — Bridge of Spies, A Good Day to Die Hard, etc. ), in Germany when she died under mysterious circumstances. Her grieving father, upon reading the autopsy report, becomes convinced that it was no accident. Germany both refused to prosecute or extradite Krombach for the crime. France agreed to try him in absentia, but the verdict of manslaughter was set-aside. With the statute of limitations clock ticking down to zero, a plot was hatched to kidnap Krombach and deliver him to French authorities for an official trial. What happened next was a real eye-opener! Filmmaker Garenq delivers an intense thriller that follows the events, plus there are some major shocks in store for the viewer … was justice served? 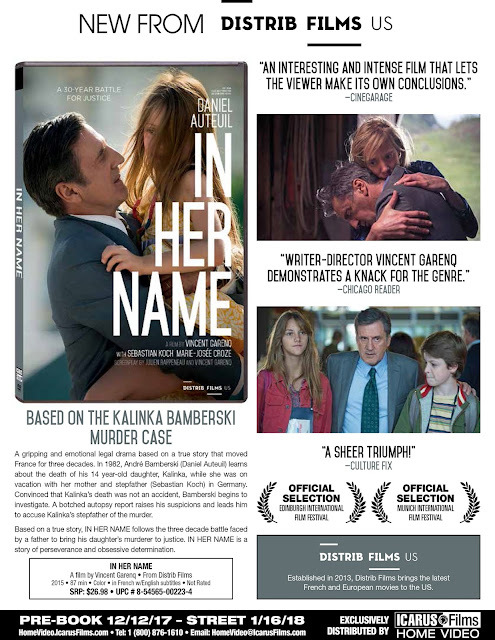 On Jan. 16 Icarus Films will reveal it all with the domestic DVD rollout of In Her Name. In Her Name is presented in French (with some German) and English subtitles. 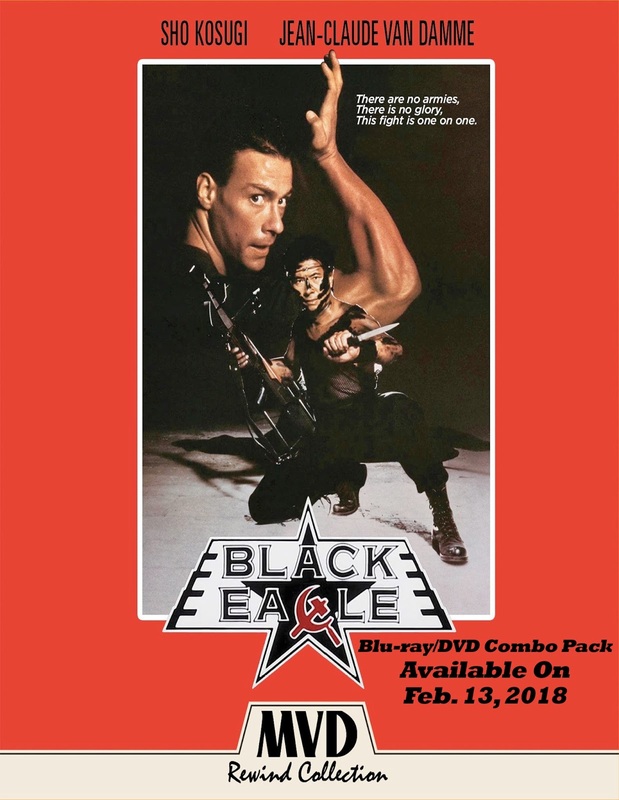 MVD Entertainment Group’s “MVD Rewind” label will be releasing a Blu-ray/DVD Combo Pack edition of director Eric Karson’s 1988 Cold War marial arts/spy-versus-spy thriller, Black Eagle, on Feb. 13. 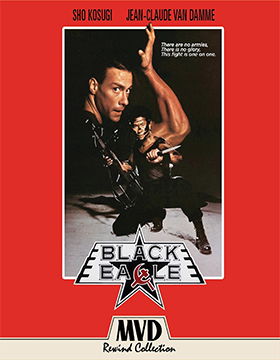 A state of the art fighter jet, with a top-secret laser tracking system, goes down in the Mediterranean (near Malta) and this begins a life and death race to recover it between the KGB, lead by Colonel Klimenko (Vladimir Skomorovsky) and his “killing machine,” Andrei (Jean-Claude Van Damme) and CIA operative Ken Tani (Sho Kosugi). It’s martial arts mayhem as these two action superstars clash with Ken Tani seemingly outmatched, but as we know from his performances in Ninja Assassin and Revenge of the Ninja, his size can be deceiving! Wolfe announced this past week that documentary filmmaker Katherine Fairfax Wright’s fun-filled documentary, Behind the Curtain: Todrick Hall, will be making its DVD debut on Dec. 19. 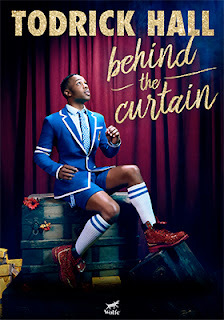 Todrick Hall, a YouTube sensation — and a force of nature — is the subject of her gaze, which, as the backstory tells us, was quite by accident. 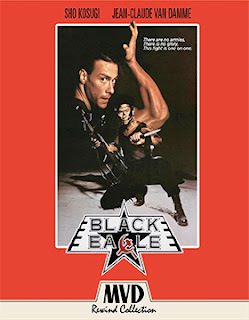 Hall had a commitment to Awesomeness Films that was beginning to encroach upon his time and a project that was he committed to was literally consuming all of his time — we won’t say “and energy” since he seems to have an unlimited supply of that. The solution, let Wright film “the project” that you are working on and let her tell your story and that will fulfill your obligation … it was a deal. 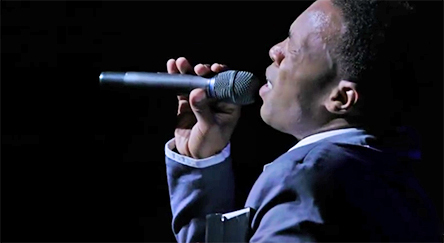 And, if the truth be known, we are all the better for this moment of business inspiration as the filmmaker becomes an insightful part of Hall’s creative process. Meanwhile, his YouTube.com presence grew and grew — a showcase for his material. Hall had envisioned a “video album” based on The Wizard of Oz, which he called “Straight Outta Oz.” Enter filmmaker Katherine Fairfax Wright during this creative process, who wound up spending the next nine months chronicling Hall’s work to fulfill his creative dream. “Straight Outta Oz” became both a performance album and a touring stage play … once you see Wolfe’s DVD release of Behind the Curtain: Todrick Hall you will want to seek out Hall’s YouTube channel and enjoy all 16 videos that encompass his “Straight Outta Oz” performance. If you are already a fan, then this documentary from Katherine Fairfax Wright is a must; a keepsake!! 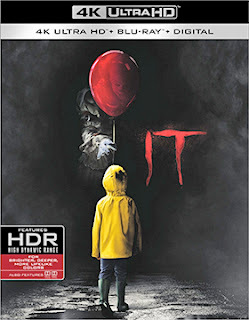 Warner Bros. Home Entertainment made it official this past week that director Andy Muschietti’s remake of Stephen King’s 1986 best-selling novel, It, will be heading home in the New Year. As a result, Dunkirk will get all of the Christmas-season attention from the studio. The street date will be Jan. 9, which yields an ARR of 123 days … box office receipts are in the stratosphere with a cumulative total of $326.6 million. The studio is already looking to the Labor Day weekend of 2019 for the next installment, which was foreshadowed — without spoilers — in the storyline of this release … so a “part two” (with those box office numbers) was a sure-thing!!! Planned for release will be a stand-alone DVD edition, a Blu-ray/DVD Combo Pack selection and a 4K Ultra HD/Blu-ray Combo Pack SKU. Arrow Video, with domestic sales and distribution expertise provided by MVD Entertainment Group, has tabbed Jan. 9, 2018 as the street date for a new 4K restoration (from the original camera negative) of writer/director Dario Argento’s 1971 giallo horror/mystery, The Cat O’ Nine Tails. Franco Arnò (played by Karl Malden), a blind man, teams with an inquisitive reporter by the name of Carlo Giordani (James Franciscus), to unravel a series of murders that seem connected to research at the Terzi Institute. Who is the killer? And why? As with the good giallo films of the period, The Cat O’ Nine Tails is a nifty blend of horror and mystery. Stylish murders and with a purpose! 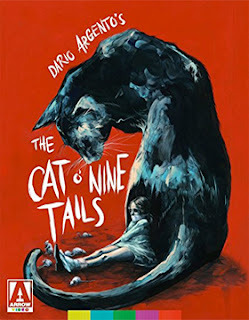 Bonus goodies include a newly-prepared commentary by critics Alan Jones and Kim Newman and new series of video sessions with filmmaker Dario Argento, co-writer Dardano Sacchetti, actress Cinzia De Carolis (as Lori, Karl Malden’s niece in the film) and production manager Angelo Iacono. Arrow Video is presenting The Cat O’ Nine Tails in both the original Italian-language version (with English subtitles) and the English-dubbed theatrical version. Word came down from Paramount Home Media this past week that Liev Schreiber will be dealing with family and “business” issues on Jan. 30 with the release of the recently wrapped fifth season of Ray Donovan. 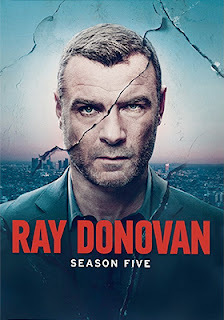 This four-disc helping of Ray Donovan: Season Five will feature all 12 episodes, which finds Ray working on his “anger” issues, dealing with a movie star client and Mickey (Jon Voight) trying to peddle the dirt (movie-script) on his many experiences. The ending, which was aired on Oct. 29, is a real cliffhanger … will it just be the “Mickey Show” next season? Did Ray die? Stay tuned as Showtime announced on the eve of the airing of the final episode of season five that the series will be back for a sixth season!!! Bonus features are being worked on and should be revealed soon. In other release news from Paramount Home Media this week, the 1988/1990 sci-fi series, War of the Worlds, starring Jared Martin and Lynda Mason Green — with Adrian Paul joining in the action during the second season — will be available on Feb. 6 as an 11-disc set featuring all 43 episodes.